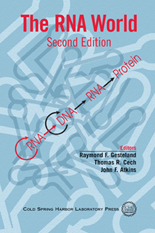 The splicing of precursors to mRNAs occurs in two steps, both involving single transesterification reactions (Fig. 1). The first step generates a 2′ – 5′ bond at the branch site upstream of the 3′ splice site and a free 3′ hydroxyl group on the 5′ exon. The resulting lariat RNA intermediate, with its slow migration in gels, is the most common assay for splicing in vitro. In the second step, attack of the 3′ hydroxyl on the phosphodiester bond at the 3′ splice site displaces the lariat intron with a 3′ hydroxyl group and results in joining of the two exons. The bimolecular nature of the intermediate in splicing indicated that the reaction must occur within a stable splicing body or spliceosome. Surprisingly, assembly and functioning of the spliceosome requires approximately 100 polypeptides and five small nuclear RNAs (snRNAs), not considering gene-specific RNA-binding factors. There are two distinct types of spliceosomes in most cells. The major class or U2-type spliceosome is universal in eukaryotes, whereas the minor class or U12-type spliceosome may not be present in some organisms. The evolutionary relationship of these two spliceosomes is uncertain.